CLEMSON, S.C. (AP) — Clemson defensive coordinator Brent Venables swears he wasn’t really concerned about the preseason hype around his defensive line. “Maybe a little,” Venables said when asked about any fears he had about their mindset entering the season. The accolades and magazine covers piled up this summer for the Tigers‘ talented defensive front: Defensive ends Clelin Ferrell and Austin Bryant; tackles Christian Wilkins and Dexter Lawrence. As it turns out, Venables didn’t have to worry at all about how they would handle the attention. The group will lead No. 2 Clemson (12-0, CFP No. 2) against Pittsburgh (7-5) as the Tigers hope to capture a fourth straight Atlantic Coast Conference championship Saturday night. The Tigers front has been dominant for a defense ranked seventh nationally. 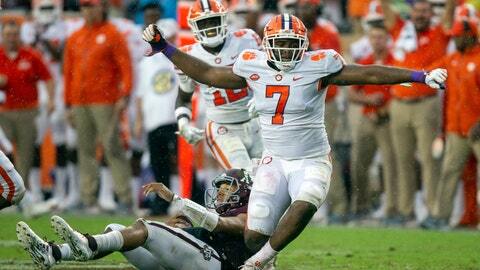 Clemson is second in the Football Bowl Subdivision with 112 tackles for loss and tied for second with 43 sacks. The four starters have combined for 43 stops behind the line and 22 sacks, with the lightning fast Ferrell leading the way with 15.5 tackles behind the line and 10.5 sacks. Pitt fullback George Aston said the Panthers have faced big, strong defenders before. The group’s heart and soul is unquestionably Wilkins, a thoughtful, determined, 315-pound tackle who’s made headlines for just about everything during his four years at Clemson. His spin move and split was the highlight of the Tigers’ national title celebration two years ago. He’s the first defensive lineman to score a TD at Clemson on a pass against Troy in 2016. He’s run for two more this season as part of Clemson’s “Fridge Package” on offense where Wilkins and 350-pound Lawrence line up in the backfield. Wilkins has taught grade schoolers as a substitute teacher this offseason after coming back for his senior year. He’s also organized Clemson’s lineman to dress up as his beloved Power Rangers, the group stopping by the homes of Clemson’s coaches at Halloween a couple of years back. Sometimes, Wilkins takes it too far. He was criticized for goosing an Ohio State runner in a College Football Playoff semifinal two years back. This past Saturday night, Wilkins was yelled at by coach Dabo Swinney after striking the Heisman pose in the end zone and drawing an unsportsmanlike conduct penalty. “I said he’ll never run the football again if he ever does that again,” Swinney said following Clemson’s 56-35 win over South Carolina. Swinney’s proud of Wilkins’ growth and knows he’s made Clemson better with his attitude and ability. Ferrell and Bryant both joined Wilkins in returning to Clemson last winter when all three were likely to be early NFL draft choices. While Wilkins and Bryant are seniors, Ferrell and Lawrence are juniors who could spent another year with the Tigers. Ferrell and Lawrence, widely projected as first rounders, say they’re undecided on their futures. What is clear is how they’re playing at the moment. The Tigers rank second in the country against the run, permitting less than 85 yards a game on the ground. Pitt’s offense centers on its run game where it’s third in the ACC with 232 yards a game. Panthers coach Pat Narduzzi knows the challenge his team faces with Clemson’s line. He said it’s rare enough to find one or two fast, strong difference makers on the line.